Read the following descriptions to learn more about the use of AIOMFAC-web, the types of calculations that can be done, the interpretation of model results, and how to deal with error messages. 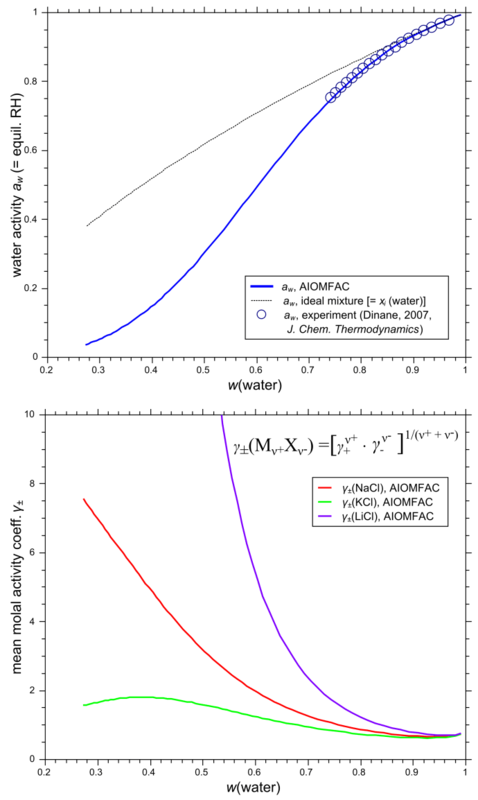 AIOMFAC is a thermodynamic model designed to calculate the non-ideal mixing behavior in liquid or liquid-like solutions, expressed in terms of activity coefficients (About AIOMFAC). Therefore, the main results of an AIOMFAC-web computation are the activity coefficients, γj, of the chemical species, j, as a function of mixture composition and temperature T (the inputs). In mathematical terms: γj = f (T, x1, x2, ..., xj, ..., xk-1) for a system of k components, where the function f represents the AIOMFAC model and the composition is expressed in mole fractions xj. It is important to note that AIOMFAC-web performs calculations of activity coefficients assuming a single mixed phase given by the stated composition – the model does not calculate thermodynamic phase equilibria or liquid-liquid phase separations on its own. To compute the number and compositions of stable phases at thermodynamic equilibrium based on AIOMFAC, an equilibrium model such as the one developed by Zuend et al. has to be employed (Zuend et al., 2010; 2011; Zuend and Seinfeld, 2012; 2013). Hence, AIOMFAC (and AIOMFAC-web) only solves for activity coefficients in individual liquid phases, for which the compositions are given by the user or determined by a thermodynamic equilibrium model. However, since thermodynamic equilibrium models rely on a global minimization of Gibbs free energy, which depends on activity coefficients, models such as AIOMFAC are a main component of any equilibrium approach involving liquid mixtures (Zuend et al., 2011). Keeping in mind that AIOMFAC-web just calculates the activity coefficients for whatever system is input by the user, the resulting activity coefficients (and activities) may or may not represent the values the system would exhibit at thermodynamic equilibrium. If instead the system would undergo liquid-liquid phase separation or form solid phases in equilibrium with a saturated solution, the actual activity coefficients would be different from a single-phase calculation, since the composition of the considered phase would change. Therefore, under certain conditions the AIOMFAC-web calculations will represent the solution of a metastable or unstable liquid system. Sometimes computations referring to metastable solutions are intended, e.g., when calculating activities in metastable, supersaturated electrolyte solutions representing the dehydration branch of a humidity cycle (e.g., of electrodynamic balance experiments) towards the crystallization (efflorescence) of an inorganic salt. Concerning organic compound activities, a mole fraction-based activity a(x) > 1 indicates that the pure component would be more stable than the compound in the mixture, so that in reality the mixture would undergo phase separation (at the latest at this point, but in partially miscible multicomponent systems often already at a(x) < 1). In case of organic components and water, activity coefficients γ(x) >> 1 are typically also an indicator for metastable / unstable conditions with respect to a liquid-liquid phase separation. However, the exact compositions and activity coefficient values at which a phase separation will occur depend on the defined system. An accurate prediction of a liquid-liquid equilibrium requires finding the global minimum in Gibbs energy, either with a direct global optimization method (e.g., Zuend et al., 2010) or, more efficiently, by solving a system of nonlinear equations in conjunction with Gibbs energy minimization (e.g., Zuend and Seinfeld, 2013). Such a prediction is computationally expensive, especially regarding multicomponent systems, and currently not made available as an online-tool. If you would like to perform such equilibrium computations based on AIOMFAC, consider contacting the authors for a potential scientific collaboration. AIOMFAC-web is currently set up to allow up to 20 different system components and up to 101 data points for each model run. Besides organic-inorganic mixtures, one can of course also define pure aqueous electrolyte solutions or electrolyte-free organic mixtures. To run the AIOMFAC-web model one has to specify the system for which computations are requested. This involves two main parts: (i) defining the components of the system and (ii) stating the data points (temperature and composition) for which calculations should be performed. These specifications are made in the input form (Run Model), described in more detail below. Alternatively, one can also directly edit an input text-file saved from a previous session, e.g., to conveniently keep the system component definitions, but change the data points. In case an input file is edited, make sure to adhere to the format structure of the file. Filling out the input form is intended to be straightforward. On the Run Model page just select and define one or several options at each subtitle position (step) of the form. The info buttons on the right side of each step provide additional information. For clarity, the different steps of the form are explained in a bit more detail here. Fig. H1. 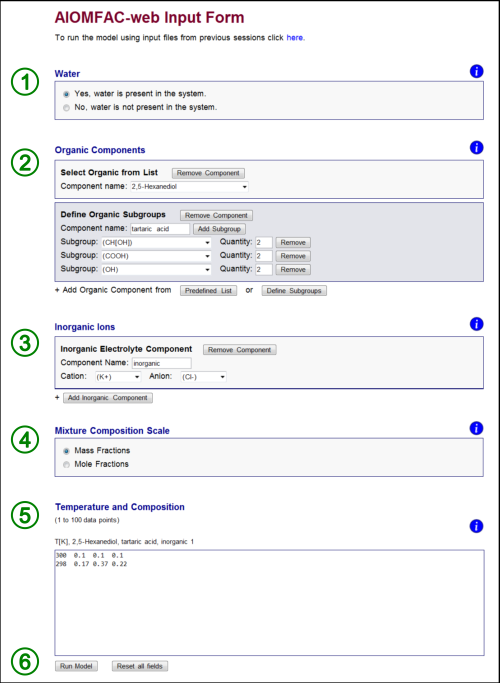 AIOMFAC-web input form indicating the six steps of filling out the form (see text). In this example, a system consisting of the four components water, 2,5-hexanediol, tartaric acid, and KCl has been defined along with two data points (entered on two rows). Click here to display a larger version of this image. Water: Indicate whether water is a component of the liquid mixture by selecting the corresponding radio button. Water will be set as system component no. 1 when present. If electrolyte species are part of the system, either water or at least one organic compound need to be defined too (acting as solvent for the inorganic ions). Organic Components: Define the organic compounds of the system – if any should be present. To do so, click on the button "Predefined List" to select a component for which the corresponding AIOMFAC subgroups have been defined by the developer. This list currently comprises the different organic compounds which have been used in the study of Zuend et al. (2011). To define an organic compound that is not found in the list (e.g., tartaric acid in Fig. H1), use the button "Define Subgroups" to select the different subgroups of the molecule and set the corresponding number of occurrences in the molecule in the field "Quantity". Additional subgroups can be entered by clicking the button "Add Subgroup". The order of the subgroups stated is irrelevant, but make sure that each individual type of subgroup is only stated once per compound. If you do not know how to section a molecule into different subgroups, read the information in About AIOMFAC and/or study Table 3 of Zuend et al. (2011). Entering a name of the organic compound is optional. The name will be displayed as a header of the text area input field in step 5 (see Fig. H1). An entered name will also be used in the model output and might be helpful to identify the component. 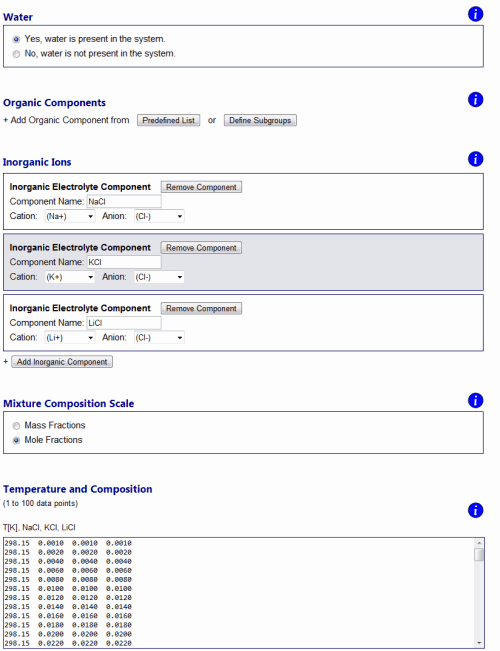 Inorganic Components: Click the button "Add Inorganic Component" to define inorganic ions. Naming the inorganic component is optional. An entered name will be displayed as a header of the text area input field in step 5, otherwise a unique name will be generated. In the model output, the name of the different ions will be used instead. Inorganic components, i.e., neutral electrolyte units composed of inorganic ions can be introduced by selecting a cation and a corresponding anion from the drop-down lists. AIOMFAC treats electrolyte units as completely dissolved into cations and anions in solution and corrects for partial dissociation implicitly via the activity coefficients (with the exception of the bisulfate ion, HSO4-, for which partial dissociation is explicitly considered). Mixture Composition Scale: Use the radio buttons to indicate whether the mixture compositions of the data points entered in step 5 are given as mass fractions or mole fractions. If the mole fraction scale is selected, note that in the input form the mole fractions have to be entered as expressed on the basis of undissociated components. This only matters when ions (electrolytes) are part of the system. Mass fractions as composition scale are unambiguous in this respect. Temperature and Composition: Use the text area to enter data points for which computations should be performed. Enter temperature in Kelvin followed by the composition as indicated in the text area header. Up to 101 data points are allowed in each model run. It is important to note that only the mole or mass fractions for components 2 and higher need to be entered. The mass or mole fraction of component 1 (be it water or the first organic component) will be calculated based on the sum of entered values (the sum of all mass or mole fractions has to be equal to 1). Use period (.) as decimal point and separate different values by a tab, space, or comma + space. Different data points need to be entered on different rows of the input area. If many data points are going to be entered, it is recommended to use a spread-sheet or text-editor program to prepare the data and copy&paste it into the text area. Run Model: Click on the button to run the AIOMFAC-web model. If any critical input is missing from steps 1 to 5, a warning message will pop-up at this point. If all form entries are valid, the data will be used to generate an input file and the model will be called. If the model finds data of the text area (step 5) to be erroneous, an error message stating the problem will be displayed. Otherwise the model will run and the results will be shown almost instantaneously. For the purpose of demonstration, we will discuss here the AIOMFAC-web output resulting from the input data shown in Fig. H1. The input file of this example can be downloaded from here (right click, "save linked content as"...), so that you can run the model with this input file to generate the output page, if you wish to do so. Fig. H2. AIOMFAC-web output. In this example, the results for the input from above (Fig. H1) are shown. The numbered sections (1) – (4) are explained in the text. Note that in this example the AIOMFAC-web output for point no. 2 represents a metastable solution for two reasons: (i) the mole fraction-based activity of 2,5-Hexanediol, a_x(02), is greater than 1, which means that a phase separation would be stable for sure (as discussed above) and, less obvious, (ii) dissolved KCl is supersaturated with respect to its crystalline salt, as the molal ion activity product IAP = [a_m(K+)]1	× [a_m(Cl-)]1 is greater than the IAP of the saturated solution of KCl; IAPsat(KCl) = ~7.95 at 298 K, as determined from measurements of the solubility limit using AIOMFAC. Click here to display a larger version of this image. The structure of the model output typically looks like the one shown in Fig. H2. The different sections on the output page, numbered in Fig. H2, are described in the following. General system information: Here two links are provided to download the generated input file and the model output for your records (plain ASCII text files). The output text file can be imported easily by various programs for further processing and plotting. Furthermore, information on the system calculated and links pointing to the individual tables of the chemical species are provided. Note that an electrolyte component (input cation-anion combination) is counted as one thermodynamically independent component, while the ions are tabulated individually. Table key: The different table headers of the data tables and corresponding units are explained in this section. Data tables: Data tables are given for each chemical component of the system individually. In case of organic compounds with user-defined subgroups, as a check it is recommended to verify the reported "Component's subgroups" formula with the compound's chemical structure. The RH value is equivalent to the mole fraction-based water activity of the solution. The compositional amount ("concentration") of each species is given in terms of mass fractions, w, mole fractions, x_i, and molality, m_i, where "_i" denotes calculation basis with respect to dissociated electrolyte components. Mole fraction basis of activity coefficients and activities is here denoted by "_x". 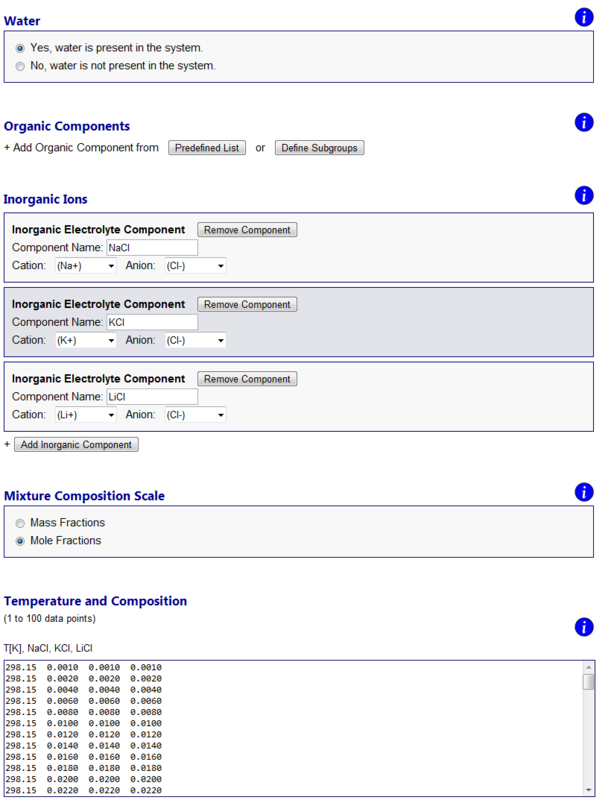 Inorganic ions: Data tables for electrolyte components are given for each ion separately. This makes sense because in mixtures containing several electrolytes with potentially common ions, the distinction and attribution of an ion to a specific electrolyte would be ambiguous. Activity coefficients and activities of ions are reported on molality basis denoted by "_m". See, e.g., Zuend et al. (2008) for a definition of activities and corresponding reference and standard states on molality basis and mole fraction basis. For comparison of model results with experimental data it is often necessary to calculate the mean molal activity coefficient of an electrolyte, γ±(m), or the molal "ion activity product", IAP, both of which are easily calculated from the tabulated molal activity coefficients, molal activities, and integer electric charges of the ions. If an error occurs due to invalid model input or numerical issues, an error message will be shown on top of the Results page. Error messages are designed to state a possible cause of the problem and indicate to the user what needs to be checked / changed on the input side. For example, if one tries to perform model calculations for a system containing certain organic main groups and inorganic ions which require interaction parameters that are not available (see About AIOMFAC, Fig. 4), an "AIOMFAC ERROR 1" message will be displayed and model execution canceled. Numerical issues that apply only to a subset of data points and do not constitute an overall error, are flagged with a non-zero error number in the model output tables. Warning notifications are shown in some cases when the input is technically valid, but caution is advised due to input data points outside of the recommended parameter range. For example, a warning message will be shown on the output page if the temperature of a data point is set as T < 288 K in case of an electrolyte-containing mixture. Data points affected by a warning message are flagged with the corresponding warning number. The following examples demonstrate a selection of different kinds of questions that can be addressed using AIOMFAC-web. Measurements of activity coefficients of individual ions in binary water + ion mixtures are impossible due to repulsive long-range electric charge interactions between ions of the same charge. Aqueous solutions of electrolytes therefore always contain both cations and anions in a balanced ratio to achieve electroneutral conditions on the macroscopic scale. This means that experiments can only provide a combined cations-anion non-ideality property of the dissolved electrolytes, which is typically evaluated as a mean activity coefficient based on ion molality and electrical charge of the ions. An overall neutral electrolyte unit can be expressed by the general chemical formula Mν+Xν-, with ν+ cations M of positive electrical charge and corresponding ν- anions X, e.g. NaCl (a 1:1 electrolyte with ν+ = ν- = 1) or (NH4)2SO4 (a 2:1 electrolyte with ν+ = 2 and ν- = 1) (Zuend et al., 2008). On molality-basis, the so-called mean molal activity coefficient is then defined as the geometric mean, γ±(m) = [γ+ν+ × γ-ν-]1/(ν+ + ν-); here the superscript (m) is often omitted as molality basis is almost always used. The use of mean molal activity coefficient data from electromotive force measurements, e.g., for the fit of AIOMFAC parameters, is discussed in Zuend et al. (2008; 2011). In contrast to experiments, models have no problem in defining and calculating individual activity coefficients of ions. This is also the case in AIOMFAC and the output page reports individual molal activity coefficients of the ions in a system. However, using the expression given above, γ±(m) is quickly calculated for an electrolyte of interest based on the model output. In Fig. H3., an example is shown for an aqueous solution of three electrolytes, the chlorides NaCl, KCl, and LiCl. The input file of this example can be downloaded from here and the corresponding input form is shown in Fig. H3. ; the AIOMFAC-web output text-file is given here. The data points are stated in mole fractions (with respect to undissociated salts) and defined such as to keep a fixed 1:1:1 molar ratio of the three salts in solution. Fig. H3. 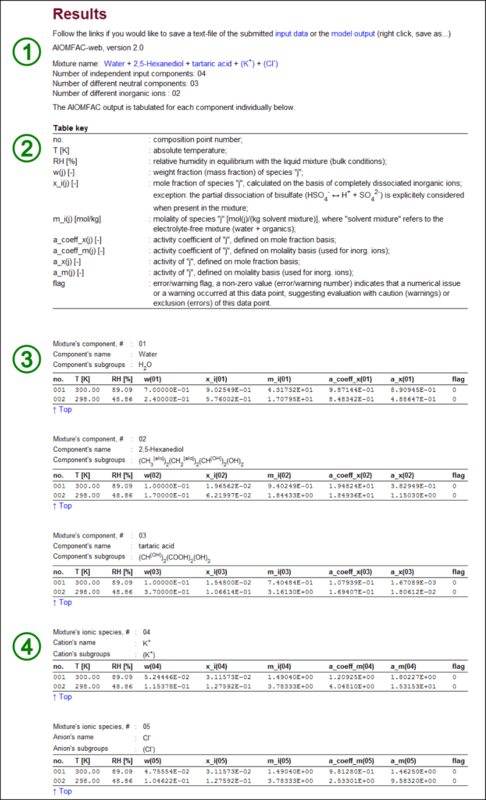 Example 1 model input form and graphs of AIOMFAC-web results. An aqueous system of the three chlorides NaCl, KCl, and LiCl is entered with data points representing a fixed molar salt ratio of 1:1:1, covering total ionic strength from dilute to highly concentrated (supersaturated) conditions at 298.15 K (76 points entered in total). The result graphs show a comparison of calculated and measured water activity data plotted vs. mass fraction of water (upper panel). The deviation of this aqueous solution from ideal mixing behavior at higher electrolyte concentrations is evident from the comparison to the water activity curve of the corresponding ideal mixture. The lower panel shows the mean molal activity coefficients of the three different salts in the solution, all of which share Cl- as the common anion. Click to display a larger version of the input or of the result graphs. The different curvatures of the mean molal activity coefficients of NaCl, KCl, and LiCl, shown in the lower panel of Fig. H3, represent the specific effects of different cations combined with the common anion Cl- in a solution. Li+ is the smallest of the three cations, with the highest surface charge density, K+ the largest one. As the solution approaches infinite dilution, where the mass fraction of water, w(water), is virtually 1.0, all mean molal activity coefficients approach the reference value of 1.0. The activity coefficient of water is influenced by the presence of the inorganic solutes and coupled to the ion activity coefficients via the Gibbs-Duhem relation. Dinane (2007, J. Chem. Thermodynamics 39, 96–103) has measured bulk water activities of this system in the concentration range subsaturated with respect to salt solubilities. These data are shown in Fig. H3 in comparison to the AIOMFAC-web data (these data were also part of the database used to fit AIOMFAC parameters). It is evident from Fig. H3 that the system deviates from an ideal mixture as the solution becomes more concentrated. The AIOMFAC-web curve shows excellent agreement with the experimental data and furthermore provides a reasonable description of water and salt activities from high to low relative humidity (low to high electrolyte concentration). Mean molal activity coefficients of electrolytes can also be measured in organic-inorganic mixtures and computed with AIOMFAC-web for any kind of system (in the applicable temperature range). At atmospheric or lower pressures (~ ideal gas behavior), the laws of thermodynamics dictate that a liquid solution (bulk liquid, no curvature effect) in equilibrium with a gas phase (e.g., air) exhibits a water activity equivalent to the relative humidity (RH) in the gas phase. The water content of a solution changes when the RH changes. This is for example described by the hygroscopic growth behavior of water-soluble aerosol particles. The standard "forward" calculation mode of AIOMFAC is to compute activity coefficients as a function of temperature and solution composition. If we, however, want to calculate the water content of a mixture at a given RH and temperature (in equilibrium with that mixture), we need to solve for the mixture composition as a function of water activity. Since a change of mixture composition affects all activity coefficients in a non-linear manner, such a calculation requires an iterative approach. In general, this type of thermodynamic equilibrium problem can be solved with a gas-particle partitioning or vapor-liquid equilibrium model, such as the one of Zuend et al. (2010). However, a good estimate for a mixture's water content can also be obtained without a numerical iteration method, with just 1 to 3 "manual" iterations using AIOMFAC-web, as demonstrated in this example. Select the system components using the input form on the Run Model page (all organic components are available in the predefined list). Define the mixture composition such that a wider range of water contents (and RH) are covered, while adhering to the fixed mixing ratio of the water-free mixture. Since we look for a RH of 85 %, the mole fraction of water should cover the range around x(water) = 0.85 (assuming the activity coefficient of water will not be too far off from 1.0). It is recommended to prepare the temperature and composition data in a spreadsheet program, which will allow convenient modification of the data in follow-up iteration steps. The example AIOMFAC-web input file of this step is available for download here. Note the choice of the mole fraction as composition scale. The AIOMFAC-web results to this input (see output file) show that RH = 85 % is bracketed by composition points 22 and 23. The values of mass or mole fractions of component 01 at these points provide already an estimate for the water content at 85 % RH: the mass fraction of water is between 0.486 and 0.500. To get a higher precision estimate, the mixture composition within this composition bounds can be refined in a second calculation. Go back to the input form using the browser "back" button. Now a refined input composition dataset can be prepared using the values of the previous input points 22 and 23 as bounds on the mole fractions. The AIOMFAC-web input file with a higher resolution dataset bracketing the target mole fractions is given here. The AIOMFAC-web results to this refined input are given in this output file. You can also use the provided input text file and upload it on the Upload Input File page to reproduce the model results in your browser. Data point 71 of the model output provides now a better resolved value for the predicted water content at 85 % RH: the mixture contains w(01) = 0.490401 mass fractions of water, equivalent to x_i(01) = 0.833621 in mole fractions (with respect to completely dissociated ammonium sulfate). The output value of the water activity, a_x(01), at point 71 shows that, more precisely, RH = 0.849979 (rounded to 6 significant figures). This is a precision high enough for most applications. Additionally, the values at data points 70 and 72 provide an estimate on the variation of the water content at this RH in the liquid mixture with respect to small changes in RH (or composition). Steps 4 and 5 could be repeated to achieve even higher precision, if desired. It is also recommended to have a look at the activities of all compounds (and the IAP of the electrolyte) to estimate whether a single mixed phase is stable at the target composition or whether it is likely that the mixture would undergo phase separation (see also Single-phase computation vs. equilibrium state above). In the current example, at 85 % RH all mole fraction-based activity coefficients of water and the organics are close to or smaller than 1.0, all activities smaller than 1.0 and the IAP of ammonium sulfate is below its solubility limit value. Hence, without relying on a Gibbs energy minimization computation, it is justified to assume that the single-phase mixture is thermodynamically stable. In this example the calculation of the deliquescence relative humidity (DRH) of a salt (here ammonium sulfate) in an organic-inorganic mixture is demonstrated. The deliquescence relative humidity of aqueous solutions is thermodynamically related to the solubility limit (saturation concentration) of a compound in a solution and the corresponding state is the solid-liquid equilibrium (SLE), (see, e.g., Zuend et al., 2011). The 7-component system from Example 2 is used here and the focus is on the DRH of ammonium sulfate (AS). However, note that in multicomponent solutions, several compounds could potentially form solid, crystalline phases in equilibrium with a saturated solution (depending on the system temperature and the melting point of possible solids). Therefore, in general, there are also several DRH pertaining to the solubilities of the system components (or stoichiometrically fixed component mixtures in case of hydrates and mixed crystals) and the highest DRH defines the RH above which the entire mixture will be in the liquid state (but not necessarily as a single liquid phase). Apelblat (1993, Chem. Thermodynamics, 25, 1513-1520) measured the solubility of AS in water. At 298.15 K, the solubility limit is given as 5.790 molal (i.e., 5.790 mol AS per kg of water). We use this value to calculate the IAP of AS at 298.15 K. Converting the molal value to mass fractions, the solubility limit is w(AS) = 0.433455 in the binary aqueous mixture. Hence calculating the activities at this composition with AIOMFAC-web yields a RH (= DRH(AS), in this case) of 79.90 %, a_m(NH4+) = 2.53808 and a_m(SO42-) = 0.160662 (output file). This DRH is in excellent agreement with the experimental values listed in the review paper of Martin (2000, Chemical Reviews, 100, 9, 3403-3453). The molal ion activity product of (NH4)2SO4 is calculated as: IAP = [a_m(NH4+)]2 × [a_m(SO42-]1. Thus, using the values from above for the saturated solution at 298.15 K: IAPsat = 1.03496. This is the quantity with respect to which we need to evaluate the multicomponent system in order to find the DRH and mixture composition at saturation with respect to AS. As in Example 2, we define a system consisting of the seven components: water (1) + malic acid (2) + malonic acid (3) + maleic acid (4) + glutaric acid (5) + methylsuccinic acid (6) + (NH4)2SO4 (7), in which the organic acids and ammonium sulfate are present at a fixed molar mixing ratio of 1:1:1:1:1:1. We can now perform a similar computation as in Example 2 to cover a wide range of water contents (input file) and evaluate the IAP of AS from the AIOMFAC-web output (output file). The calculated IAP of AS from the model output data are depicted in Fig. H4 below. The evaluated IAP from the AIOMFAC-web output show that points 70 and 71 result in IAP(AS) = 1.01647 and IAP(AS) = 1.04747, respectively, which are close to the IAPsat = 1.03496 found in step 2 above. If this level of precision is sufficient, we can take the mixture composition and RH at point 71 as the deliquescence point of AS in this multicomponent system. If a higher precision is required, the composition data of points 70 and 71 could be used to create new input composition data with a higher resolution around the target IAP, analogous to the approach described in Example 2. Of course, one can also use a linear interpolation using the points bracketing the target IAP value. Here, a linear interpolation results in RH(IAPsat) = ~ 48 % RH. Fig. H4. Example 3 output graphs of the AIOMFAC-web results. Shown are the IAP and water activity of the system water + malic acid + malonic acid + maleic acid + glutaric acid + methylsuccinic acid + (NH4)2SO4 at 298 K, corresponding to the model output described in the text (output file). The x-axis represents mole fraction of water in the mixture, as defined on the basis of completely dissociated ammonium sulfate, i.e., x_i(01). 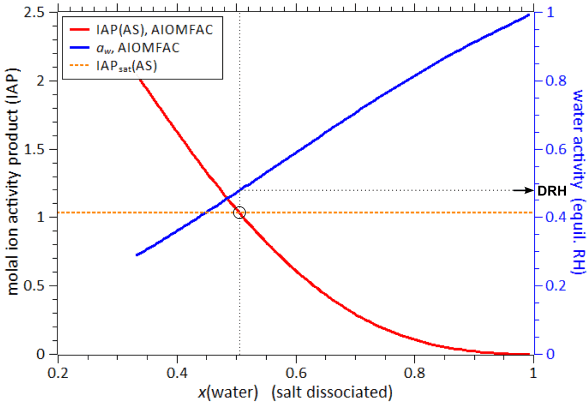 The dashed orange line shows the IAP of ammonium sulfate (AS) at the solubility limit, as derived from the AIOMFAC-web calculation of the saturated binary aqueous AS system at the same temperature. The black circle indicates the point where AS in this 7-component system is saturated and the corresponding deliquescence relative humidity (DRH), ~ 48 % RH, is found using the blue water activity curve (right y-axis). The resulting DRH(AS) value of the 7-component system is with ~ 48 % RH much lower than the one of AS in pure water (~ 80 % RH). Having other soluble species in a multicomponent mixture typically lowers the DRH of a salt. In this example the change in DRH is quite dramatic due to the rather high polarity and hydrophilicity of most of the dicarboxylic acids present in the system, which affect water activity and the solubility of ammonium sulfate. For more extensive (offline) calculations, a numerical algorithm can be used. When the solubility limit of a compound in a binary system (e.g. aqueous solution) is known, the solubilities and deliquescence relative humidities in different mixtures can be computed efficiently to high numerical precision using an iterative solid-liquid equilibrium algorithm based on AIOMFAC, as described and applied by Zuend et al. (2011). All pages of the website have been checked with the HTML and CSS standard compliance validators (http://validator.w3.org/) of the World Wide Web Consortium (W3C) and all passed the test. If you find broken links or run into other technical issues (404 error pages etc. ), we would appreciate if you report the problem to the webmaster stating time of access, encountered error, and additional information about the problem.